When I checked into Twitter this morning I was perturbed to see a flurry of panicky messages from astronomers down under. No wonder. 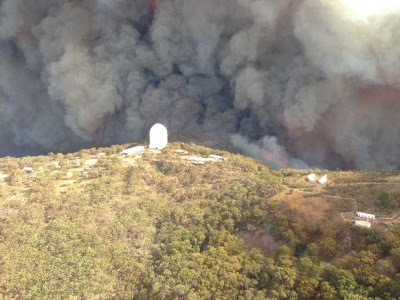 The bush fires that have been raging in New South Wales for some time yesterday threatened to engulf the world-famous Siding Spring Observatory – the largest optical observatory in Australia – where 12 important telescopes are located, not to mention the people that operate them. I’ll direct you to Amanda Bauer’s blog piece for dramatic coverage of what was obviously a terrifying and exhausting night, as flames and smoke crept remorsely closer to the observatory buildings. At about 3.30pm local time, the buildings were evacuated and soon afterwards the fire penetrated the perimeter of the Observatory itself and subsequently swept through the complex. Temperatures inside some of the domes went as high as 100 °C and a lot of the electrical equipment has clearly been damaged. Scary stuff but, most importantly of all, at least nobody was hurt. It also seems that damage to the observatory buildings and equipment was relatively slight. That however is a preliminary assessment, and may well be revised when it’s safe to enter the area again. Wildfires of this sort are extremely frightening things, so this must have been a very difficult time for those involved but, fingers crossed, it seems not to have turned out as badly as some feared. It’s not all that easy to get a fire started in my grate, but I managed at the first attempt yesterday. Wood has a tendency to spit and crackle while burning so I put the fireguard around.. Anyway, I kept the fire going all through the evening which meant by the time I was ready for my nightcap I had no logs left. I then remembered a bit of wood (or, more accurately, MDF) that was left over when I had some shelves fitted. I found it in a cupboard and chucked it on the fire and left the room to make a drink. A couple of minutes later my smoke alarm went off. 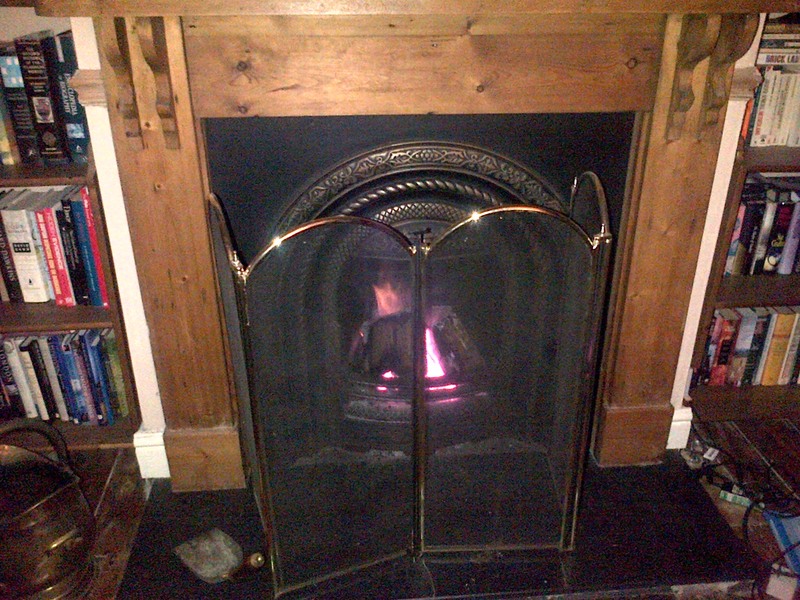 Bemused, I ran back into the living room and found it filled with acrid smoke, produced by the veneer that coated the bit of surplus shelf, which was being produced in quantities too large for the chimney to cope with. I hastily switched off the alarm and opened all the windows and doors on the ground floor, much to the amusement of the folk passing my house on the way home from the pub. Ironically my attempts to stay warm and cosy all through the evening had ended with arctic winds blowing through the house. The smoke cleared fairly soon, although the smell of it was still lingering this morning.